“Slight” is a minimal Magento theme from Polar Themes and suits online sites who would want a simple but attractive look for their stores. It can be used for sites selling interiors, apparel, kitchenware etc. The theme is also responsive, and would adapt to any display resolution such as tablets, Smartphone’s as well as conventional desktops. The theme comes in a simple and flexible design scheme that can be easily customized from the theme admin panel. You can change the color scheme, menu system, background etc and can use the free blocks to insert custom widgets and Ad banners. The homepage comes in a cool white and blue color scheme along with a full-width featured image after the page header. You can use it to add your promotional banners, images, latest products etc. The rest of the page comes in a default 4 column layout for your featured images where you can add an image, star ratings as well as a link to internal product pages. The footer block comes with included social media icons and can have text widgets. Users can use the keyword search box in the header to do a quick search for a particular product. Also included is an advanced Search facility that helps them search with multiple attributes. The Slight theme has a primary multi-level header menu for all your product categories along with a separate top menu and a provision to add internal quicklinks in the footer block . A Shopping Cart icon in the header shows the current contents and cost of the shopping cart for every browser session. The theme also displays breadcrumb navigation trails for your internal pages. Product pages come can have multiple product images that show in an embedded lightbox gallery. You can also include product tags and reviews. Users can submit reviews, product tags, compare between products and manage a wishlist of products. 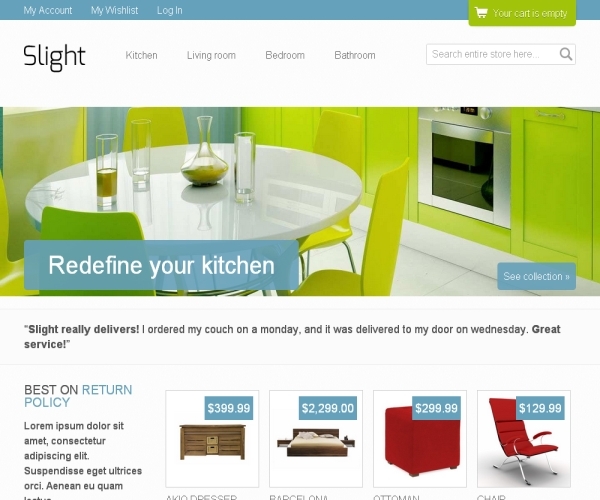 The “Slight” premium Magento theme is priced at $199.